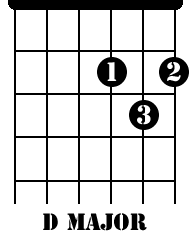 The D-A-G progression is very common in guitar chord music. What better place to start? 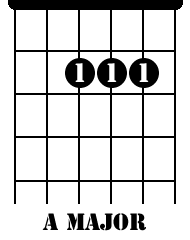 You're going to find a lot of songs out there that use this block of chords. As I find more songs, I'll add them here so you have a good bunch to choose from. Let's cover the first example. OK, so I couldn't resist pulling out a classic rock hit first off. From the very beginning of the tune, you get the D-A-G progression. For a such a simple song to play, this progression has a great sound! Here is a link to the tabs to learn this song: "Do Ya" by Electric Light Orchestra (ELO). So you can see, this is a great progression to get comfortable with as you practice your chords. 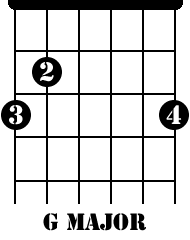 The next progression we'll cover in guitar chord music is E-B-A.